Today’s food processors and retail consumers demand gourmet quality, healthy nutritional profiles, and easy and efficient food prep. Enhance flavor, texture, and heat profiles for retail case-ready and food service microwave applications. 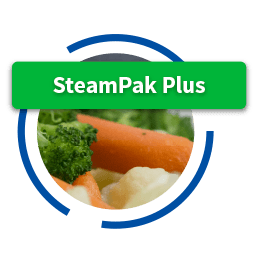 SteamPak Plus’s patented self-venting microwave steam technology truly delivers a difference you can taste for fresh and frozen applications along with the ultimate convenience of steam-in-package prep. SteamPak Plus is available in pre-formed pouch and/or roll stock format for form-fill-seal or tray lidding machines. SteamPak Plus self-venting films and pouches help retailers satisfy consumer demand for healthy & tasty quick prep food solutions. 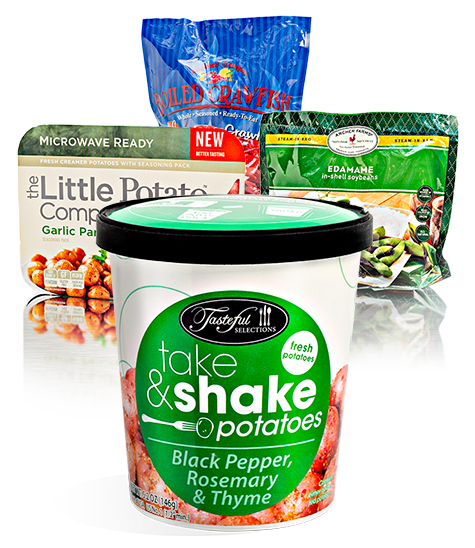 From fresh vegetables & potatoes to tasty ready meal solutions, SteamPak Plus packaging solutions helps retailers sell more with increased profitability! Whether your project calls for centrally packed or in-store packed case-ready products, contact us today to discuss how our steam-ready packaging solutions can help you achieve your project goals. Whether you’re looking for increased labor efficiency, safer HACCP-Friendly food prep, reduced food waste, or enhanced flavor, texture, & heat profiles, SteamPak Plus self-venting films deliver value for microwave cooking or retherm applications up to 235F. From pre-packed “case-to-oven” portions from your food suppliers to kitchen steam-prep portion bags, we have innovative solutions and experience that can help add value to your food service operation. Contact us to discuss how Global Source Packaging can help add your food prep process with SteamPak Plus! Deliver enhanced flavor/texture/heat profiles in food service combo oven-ready (to 400F) applications with RoasterPak Plus. RoasterPak Plus’ specialty blended nylon allows for cook-in and/or re-therm-in package convenience. Ideal for protein, starch, and vegetable portion pack applications seeking HACCP-friendly prep with labor and energy efficiency. From quick serve to casual dining concepts, RoasterPak Plus cooking bags deliver value through labor efficiency, safer HACCP-Friendly food prep, and enhanced flavor, texture, & heat profiles. These nylon cooking bags are ideal for slacking out raw or pre-cooked frozen foods overnight and cooking or retherming in the same bag, minimizing direct food contact handling by your kitchen staff, a HACCP objective! With temperature resistance to 400F, you can utilize RoasterPak Plus in a host of applications across your existing equipment, whether combi ovens and microwaves. Please reference “case study #1” regarding how RoasterPak Plus added value to one of our casual dining customers in the Case Study tab of our web site. RoasterPak Plus nylon pre-formed cooking bags help brand owners and retailers satisfy consumer demand for healthy, quick, and easy food preparation. 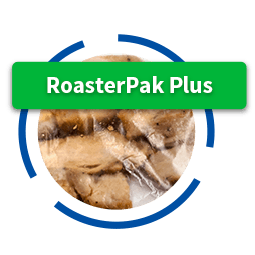 From whole chickens to side dishes to complete meal solutions, RoasterPak Plus allows the consumer to cook in the bag with minimal clean-up, less food cross contamination, and enhanced flavor & texture profiles. With RoasterPak Plus, the consumer can cook or retherm at temperatures up to 400F, which allows for the added convenience of conventional or microwave oven prep. For retailers who operate quick serve in-store delis and use microwaves and/or combi ovens like the TurboChef brand, RoasterPak Plus cooking bags are an ideal prep tool for your HACCP program efforts, and for flavor and texture profile enhancement. Please contact us today to learn more! Save Valuable clean-up time with PanLiner Plus pan liners. Available in a variety of sizes to accommodate common food service pans. Custom sizes are also available. Save time and costs in your food service operation with Panliner Plus oven-able pan liners from Global Source Packaging. Whether standard or custom sizes, our liners produced from 400F resistance nylon for high heat applications. Let our liners save you the time and water washing pans, and help optimize your HACCP Program! Contact us today for a quote to compare. 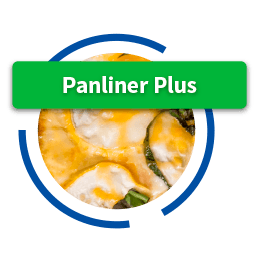 Save time and costs in your store deli with Panliner Plus oven-able pan liners from Global Source Packaging. Whether standard or custom sizes, our liners produced from 400F resistance nylon for high heat applications. Let our liners save you the time and water washing pans, and help optimize your HACCP Program! Contact us today for a quote to compare. Enhance your products’ value and sell more with state of the art packaging from Global Source Packaging! 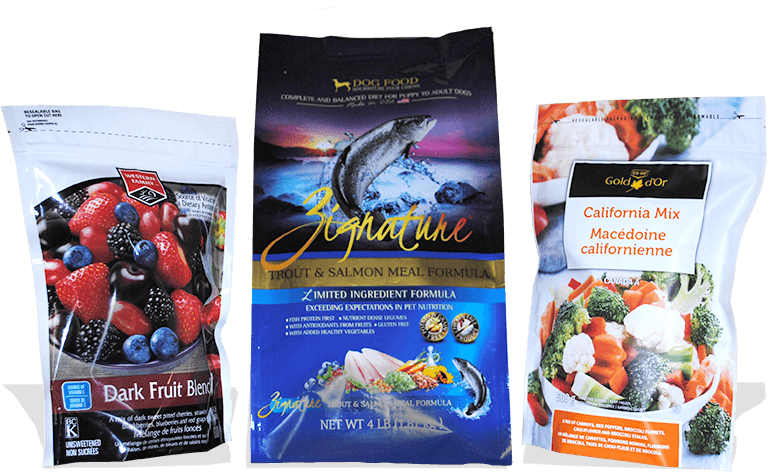 From pre-formed, zippered stand-up pouches with high-impact rotogravure graphics to cost-effective roll stock for your fill/seal machines to rigid container solutions, we can help! We understand your packaging must help optimize your production yields, withstand your supply chain abuses, and deliver ultimate value to your end user. Leverage our technical expertise and our world class ISO 9001 certified production network for packaging solutions that deliver measurable value. Contact us today, we are here to help! At GSP, we leverage multiple international packaging producers to deliver world-class quality packaging for multiple applications. Our production plants have all the required 3rd party certifications like ISO 9001, and other global quality standards. Below are just some of the packaging formats we supply and markets we service. Please contact us with your existing or new packaging specifications and performance needs. From the growing need to contain costs and shrink through “portion packing” to segregating foods during prep in their own HACCP-Friendly pouches or trays, food service operators rely on multiple packaging solutions to operate effectively. 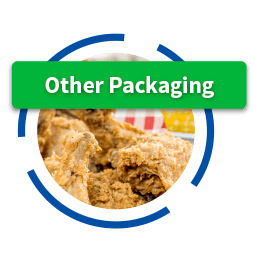 At GSP, we can deliver you value through multiple HACCP-Friendly direct food contact packaging solutions. Below are just a few examples. Please contact us with your packaging needs.